Operation Ezra & Nehemiah, also known as Operation Ali Baba, was the airlift of more than 120,000 Jews from Iraq to Israel shortly after the founding of the Jewish state. Named after the Jewish biblical figures Ezra and Nehemiah who led the Jewish people out of Babylonian exile and back to Israel in the 5th century in order to rebuild the Temple, the operation spanned more than a year and saved some 130,000 Iraqi Jews. The Iraqi Jewish community was one of the oldest such communities in the world and its members had served as philosophers, educators, doctors and even as high-ranking government officials. However, in the wake of World War II and the developing conflict between the Palestinains and Israel, conditions in the Jewish community worsened as public violence against Jews increased and government restrictions were levied. In 1947, the Iraqi government made immigration to Israel illegal and following Israeli independence it officially declared Zionism as a capital offense. Hundreds of Jews were arrested and sentenced to jail for trying to leave the country. Israel's subsequent passing in 1950 of the Law of Return, which promised immediate citizenship to any Jew who moved to Israel, led to a decision by the Knesset to help negotiated on behald of Iraqi Jews. Subsequently, in 1951, the Iraqi government passed a special bill permitting Jewish emigration - according to Iraqi law, though, Jews had to sell their property and liquidate their businesses before they could leave. Additionally, each person was allowed to take no more than $140 out of the country and could only carry 66 pounds of luggage; jewerly was also forbidden from being taken out of Iraq. Despite these restrictions, some 50,000 Jews signed up in one month, and two months later there were 90,000 on the list. This mass movement stunned the Iraqi government, which had not expected the number of immigrants to exceed 8,000, and feared that administrative institutions run by Jews might collapse. At the same time, the Zionist movement issued a manifesto calling on the Jews to sign up for immigration. It started with the following: "O, Zion, flee, daughter of Babylon," and concluded thus: "Jews! Israel is calling you  come out of Babylon!" 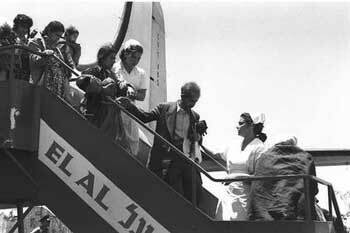 Flying the Iraqi Jews to Israel lasted several months and was done through a contract with the Near East Transport Company and with help from the Israeli national airline, El-Al. The first planes flew to Israel via Cyprus in mid-May 1951. Several months later, a giant airlift operated directly from Baghdad to Lod airport. Operation Ezra and Nehemia ended at the beginning of 1952, leaving only about 6,000 Jews in Iraq. Most of the 2,500-year-old Jewish community immigrated to Israel. The success of Operation Ezra & Nehemiah helped pave the way for future Israeli airlifts of Jews from the around the world who found themselves in dangerous conditions. Such missions include the airlift of Ethiopian Jewry (Operations Joshua, Solomon and Moses) and the airlift of Yemenite Jews in Operation Magic Carpet.